About 60 people turned out for a unique environmental photography exhibit at UNB Arts Centre this evening in Fredericton. 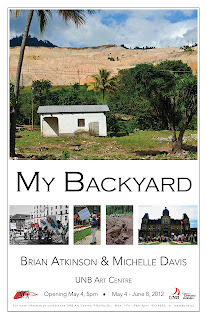 Described by the Director of the UNB Arts Centre, Marie Maltais, My Backyard is, "a display of work that seeks to inform the viewer about the people and places affected by mining, as far away and remote from our minds as Honduras, or as close to home as Penobsquis, New Brunswick. In our global village, this is our backyard." Michelle Davis, (see video below) a relative newcomer to photography, highlighted the shale gas fracking controversy and the landscape pockmarked by mining around Penobsquis. She displayed her work in concert with Brian Atkinson, a veteran freelance photographer, who's photography documents the devastation on communities by Canadian mining companies in Honduras. Both Davis and Atkinson use their lens and their social awareness to tell the story of mining and its impact on communities and their environments. While their messages are similar, these artists are on opposite ends of their photojournalism careers. Atkinson has been a freelance photographer for more than twenty-five yeas, in over seventy countries, for a variety of magazines, newspapers and international aid agencies, including CARE, CUSO and MSF, while Davis’ exploration of the media has just begun. Michelle Davis has been the owner of ChoraChroma PhotoGraphic, a photography studio based in Fredericton, for the last two years. Her work has recently expanded into photojournalism. She began following the ant-shale gas movement over a year ago when a hydro-fracking company announced that they would be setting up operations in her hometown of Astle, near Boiestown. She photographed the initial rally that was organized to protest exploration in Penobsquis and since then has covered a number of shale gas protests. The exhibition runs until June 8.